Measurements: 3 x 5 inches, or 76 x 128 mm. Back of card: Royal blue with thin gold cross-hatching. In the very center, various symbols: infinity, the sun, the earth, the horizon, god. May be inverted. Publisher: Fireside / Simon & Schuster. Printed in China. Comments: On the box it says, Renaissance symbols of science, magic & myth now reveal the future. Which only proves again that what they put on the box bears no relation to what they put inside the box. Also on the front of the box, Originally published as The Renaissance Tarot. Which I had not heard of before. It might just be me, but some of the cards looked more inspired than others. Look at the Lovers, above. He is the golden Sun and wears a Moon necklace. She is the silver Moon and has a solar necklace. They clasp hands: Left hand to left hand, right hand to right hand. He holds their right hands over his crotch. She holds their left hands over her crotch. There's all kinds of male-female, yin-yang energies in this. Note the cherub is aiming its arrow between them. When (or if) he shoots it, it completes the triangle of manifestation, or, in boy-girl terms, she gets pregnant. (Male/female energies by themselves are not enough. A mysterious third force - holy spirit, if you will - is required for manifestation/germination. Traditional Lovers cards, which this is, show this quite clearly.) The red & white roses & groups of five leaves, on two golden canes, are also significant, but cannot quite place them at the moment. In the book it says the red & white roses have alchemical meanings, but ignores the numbers 5, 10 & 25, which are repeated in the flowers & leaves on each side. 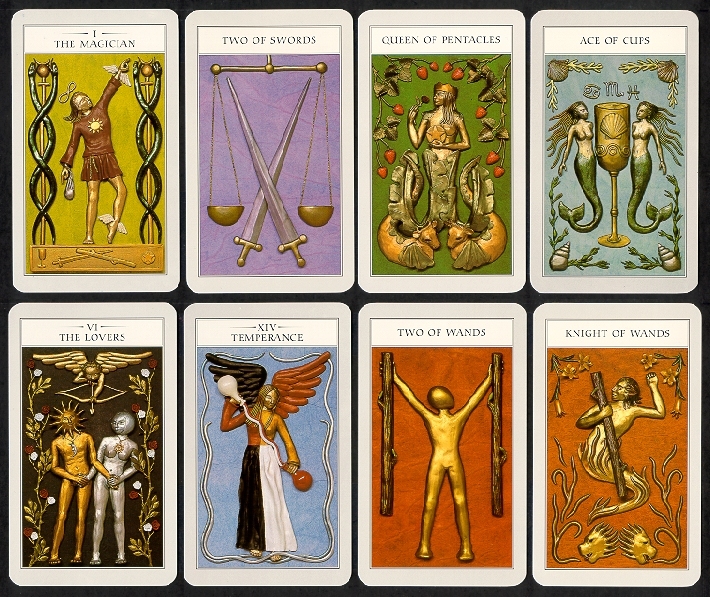 At the very bottom of the card, each of their 20 toes are clearly visible, another number of significance. Will this make any difference in day to day use of the cards? Oh, probably not!